This is the end of a three part series on authentic listening, theater companies who do it, and how empathy can change the world. You can read part one here and part two here. A couple weeks back, I wrote a bit about empathy. We live in a powerful moment in Time. Like never before, people put their ideas and emotions out for everyone to see. It should be easier than ever to understand each other, but there’s still a disconnect. Instead of seeing the humanity in each other, we selfishly lash out – often violently – at others. In the first part of this series, I wrote about breaking the offline/online binary barrier. It’s all one. To separate the two limits how we listen to each other. Bringing them together enables us to listen to our audience and be better story architects. Part two examined theater companies that equally listened to their own hearts and audience to create an entire theater movement, Geek Theater. I discussed part two with some theater artists, and a debate rose over the term, Geek Theater. Is it a movement, or just another way of branding? Brands aren’t always movements. But most movements are brands. That’s because, like a movement, brand is an action. Over the 20th Century, advertising and marketing co-opted the term brand to mean many things, and they shifted away from the visceral physical action of what a brand does. It moves people. Traditionally, companies try to move an audience to buy a product. The strongest brands become a way of life for its audience. This can spark a movement. To foster that movement, you must have empathy. 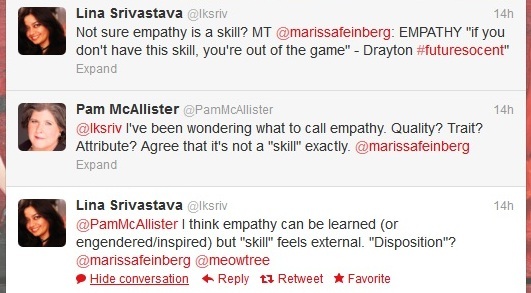 Empathy is difficult to discuss because it has many connotations and often feels intangible. My friend, Nick Bixby, commented on the first part of this series. He related a story about a filmmaker who wanted to hire him to execute the social media for a project. Nick tried to explain to the filmmaker social media isn’t something you tack on as an after thought. It’s like a garden. You must constantly tend to it. I responded to Nick by suggesting everything is a garden – creation, marketing, development – and each part must be tended with care. Empathy is like a garden, too. It must be tended. It’s not a skill you learn, like Power Point. It is akin to meditation. You must practice it daily to see a shift in dynamic. It is in our brains, and our brains are malleable. We can change how we think. If we listen to others closely and frequently, we can understand their perspectives. That won’t just make us better creators. It will make us better human beings. There are people who have studied empathy much more than I. To top off this series, I’d like to return to The Futures of Entertainment 6 and share their expert thoughts. This talk is quite a bit longer than the one I shared in part one, but there is a reason for that. It’s about listening and empathy, two topics that require deep examination. I hope you’ll listen closely to the entirety. It may actually shift how you see other people. If you have a clearer picture of others, you can give them what they want before they ask for it. If you give them what they want before they ask, you create a movement. And if you create a movement, you can change the world. The panel features Lara Lee, (@laracatalyst), Chief Innovation and Operating Officer, Continuum; Grant McCracken (@Grant27), author, Culturematic, Chief Culture Officer; Carol Sanford (@carolsanford), author, The Responsible Business; Emily Yellin (@EYellin), author, Your Call Is (Not That) Important to Us. The moderator is Sam Ford (@Sam_Ford), Director of Digital Strategy, Peppercomm. This series is the tip of the iceberg. I’ll return to these themes in my fiction and on the blog. I’d like to continue cultivating my own empathy by listening to you. Share in the comments below. What are your thoughts on empathy, listening and movement creation? Thanks a lot, James, for this wonderful piece and for your reflections on the subject. For the FoE panel, I did the one thing I can think of to do when I really want to consider a topic…surround myself with smart people whose work I deeply respect to help hash out what something means. In this case, myself included, we were a group of five people who I have found in the course of collaborations among each of the group were in different areas/realms but thinking about things from very similar perspectives…Emily Yellin had looked into what was transforming customer service and what the problem was when customer service wasn’t being transformed…Carol Sanford has spent decades working with how companies instill a sense of responsibility to their various stakeholders within their corporate structure and within the minds of each employee…Grant McCracken has written volumes of late in particular about how companies come to relate to and understand the culture they are embedded in…and Lara Lee has worked within a range of companies about how to better connect to the audiences they seek to reach via qualitative means (and how those qualitative means balance with the quantitative research which so often drives corporate decision-making). Thanks for your thoughtful responses, Sam. I’ve been pondering empathy for a while, and it’s encouraging to see it surfacing amongst creators and business people I respect. Digital has been moving so quickly, we’ve seen it as an “other.” Something new and undefined that needs new rules. Separate from “real life.” But, as part one of this series suggests, it’s all real life. We don’t need to find a new way of communicating with the audience. We need to apply simple, traditional values to these new communities. It’s a time of returning back to brass tacks. My father owns a pizza restaurant in a rural town in Illinois. He has made a great success of his business, and there are two main reasons: He has a great product, and he listens to his customers. He does this by visiting with patrons at their tables, learning their names, what they regularly eat for lunch, and listening to their lives. Carol Sanford’s perspective of businesses “serving first their customers, then their employees and partners, then the earth, then the community, and finally their shareholders” describes my father to a tee. Obviously, he doesn’t have shareholders, but I’d suggest that my father prioritizes closely to Carol’s model. “The customer is always right” is an oldie but a goodie, and large corporations taking on this old school, small town business mindset set themselves up for long term success. That gets at one of the issues. It’s easier to know your community if you are immersed in it. And a local business owner who puts a priority on listening and empathy has unparalleled access to the audiences she or he serves. At the corporate level, though, decision-makers are often very far removed from the various constituencies they serve. Or, in some cases, they were once very close but, over the years, drift further away as they get so immersed in the insular culture of their organization. But you’re right. All these things aren’t “new.” Digital communications makes certain types of relationships and interactions more visible, more frequent, more sustained, and more archived than we had in previous generations, but sharing stuff, participating in word-of-mouth, building relationships, listening…these weren’t created by a digital world, by any means. Exactly. The rise of digital gave tools to large companies to adopt/return to a small business mindset. They now have access to their audience in a way that can parallel small business. My concern is some think we need new rules for this new digital system. It’s not a new system. It’s a small town. Small town is just much larger and louder than they were 20 years ago. And accessible. The opportunity to be empathetic with this big small town is greater than ever.